NZ-Mite is a spread that is tasty and very nutritious, great for breakfast or a snack. It is low in fats and sugars, but high in vitamins and minerals. Containing iron, folate, essential B vitamins plus many more minerals and vitamins making this classic spread great for a healthy balanced diet. Perfect if you are looking for a classic taste of home. 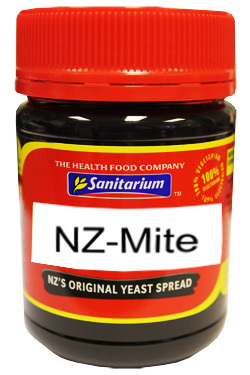 Please note that to avoid any trademark infringement we use the term NZ-Mite and re-labelled jars for UK sale. However the product is still the same Sanitarium yeast extract you know and love from home! I tried it, and I must say it taste really nice! I love it even, really worth trying! It would be strange for many that someone from Macedonia would be addicted to a yeast spread, but I am. For a long time I thought that the other 'competitor' brand was the real thing, boy was I wrong. Luckily, once it was out of stock and I decided to go for Marmite. And then it happened - true love at first bite! I never looked back ever since. We are inseparable, it runs in my blood! I bought the big size jar of Marmite as part of a Kiwi food package for a homesick friend. She mentioned that she only liked Kiwi Marmite as the UK Marmite didn't taste the same. As soon as she opened the package she stuck a finger into the Marmite to lick it off her finger! Then the whooole jar was demolished within a week! Yeah, it must be good stuff! Great stuff for homesick Kiwis!